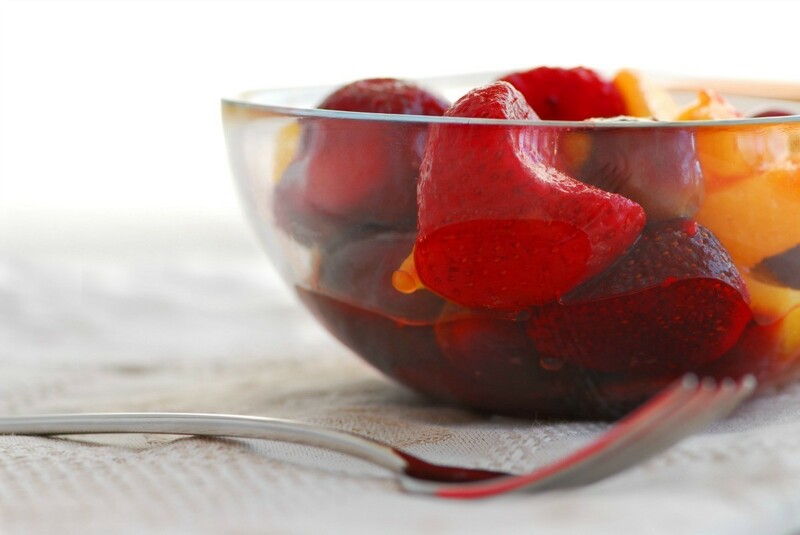 Serve an extra cool fruit salad on hot summer days, by making a delicious frozen fruit salad. This page contains frozen fruit salad recipes. Frozen whipped cream and tropical fruit. Really nice! Drain pineapple juice into medium bowl and set pineapple aside. Put bananas into the juice. In another large bowl combine cranberry sauce and sugar. Remove bananas, discarding juice, and add to cranberry mixture. Stir in pineapple, whipped topping, and nuts. Pour into a 13 x 9 x 2 inch baking dish. Remove from freezer 15 minutes before cutting. Blend cream cheese and Dr. Pepper until light and fluffy. Fol in remaining ingredients; pack into containers; freeze. Serve sliced, on salad greens. Serve 6-8. Very good salad! Simple to make and very festive! Combine all ingredients and mix well, and freeze. Add 1 cup boiling water to gelatin and dissolve. Add 1/2 can of lemonade. When it starts to set, add Cool Whip and fruit. Freeze in mold. Blend cream cheese and cream until smooth. Mix in mayonnaise, lemon juice, sugar and salt. Add well drained fruit and fold in whipped cream. Put in 9x13 inch cake pan or muffin cups and freeze 3 hours. Serve frozen on a bed of lettuce. Serves 12. Mix milk and lemon juice well. Add pineapple, marshmallows, and pie filling; mix well. Do not beat. Fold in Cool Whip until well blended. Freeze in mold (large) of 2 loaf pans. Thaw 10 minutes at room temperature before unmolding or cutting. Great for a hot day. Drain fruit well. Combine in bowl. Add pecans, confectioners' sugar, salt and marshmallows; mix well. Blend in mayonnaise and whipped cream gently. Spoon into molds. Freeze until serving time. Unmold onto lettuce-lined plates. Mix flour, sugar, 2 yolks and lemon juice. Cook until smooth, about 10 minutes. Let cool. Beat whites until stiff and fold into egg mixture. add all the fruit and marshmallows to this mixture. Fold whipped Dream Whip into mixture. Spoon into freezer containers or milk cartons and freeze. To serve, slide through entire carton if desired. Mix together all ingredients except whipped cream. Blend well. Fold in whipping cream and freeze in loaf pan.